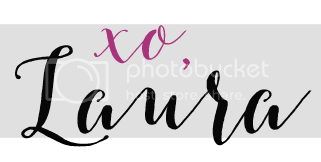 I've been trying to figure out how to organize a post like this and I think the easiest way will be floor by floor and room by room. Thankfully all of the furniture we had in our previous home is versatile enough to find a place in our new home. Our style is pretty traditional and our new home has a definite traditional vibe which was one of the reasons we fell in love with it! 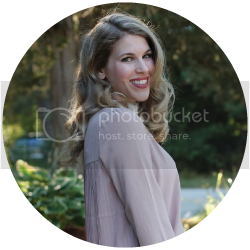 We are currently waiting on our office furniture to be delivered (hopefully next week), but once that is all in I will make sure to give a fall home tour with lots of photos! I don't feel like I have a 'green thumb' when it comes to decorating, but I do think we have a nice looking home and it is very cozy and comfortable. 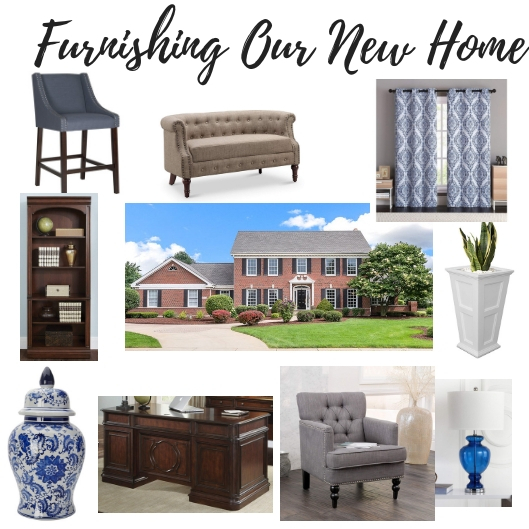 Before I started purchasing furniture, I headed to pinterest and made a board with items that I liked, rooms that inspired me, and colors palettes that would fit with our furniture and new home. You can find that here. It helped to spend a few hours on each room searching and then searching some more before I was finally able to decide what would be right. Most of the time after searching, I would come across the item that I knew would work perfectly and that made buying things so much easier. We actually didn't purchase any furniture for our basement. The basement is divided into two large rooms. On one side is the bar, wine cellar, and family room. We have a sectional, end tables, and tv on that side. On on the other side is the girls' playroom and our exercise equipment in a corner. 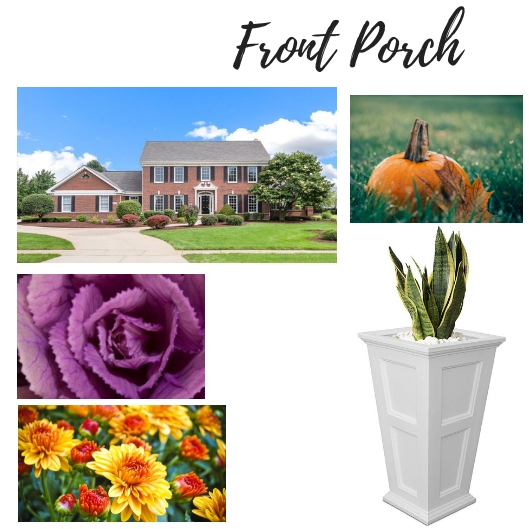 I'm excited to decorate our front porch! So many of our neighbors have beautiful pots on their porches. I finally decided on these planters in white to compliment the white trim on our home. I filled them with lots of fall flowers so hopefully I can keep them alive for a while! We have a large eat-in kitchen with a big island in the center. We already have a small table and chairs to go there for now (similar to these). Eventually I'd love to get a table that seats 6 like this one. That way, when we have company, we don't always have to sit in the dining room. It would give us more room to set serving dishes, too as our current table doesn't really have room for that. Hopefully that will be in the cards in about a year. Then we will move our current table to our basement for playing games and such. 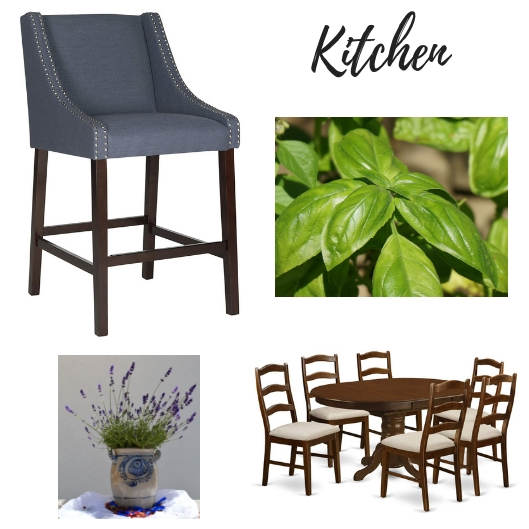 Our big purchases for the kitchen were a set of barstools. They look awesome and are really comfortable! Four of them fit perfectly at our kitchen island. The dining room was another room where we didn't purchase anything. It already had window treatments and we had a china cabinet, buffet, and dining table that we used in our previous home. It fit perfectly in the new space. When looking for a home, something that was important to us was an office space. With Matt's new job, he has the opportunity to work from home more often so we needed a designated space for him to do that. He needs to still be on conference calls and on the computer so he needed a desk so he could spread out his paperwork. The room has coffered ceilings so we wanted to continue the traditional look with the furniture. 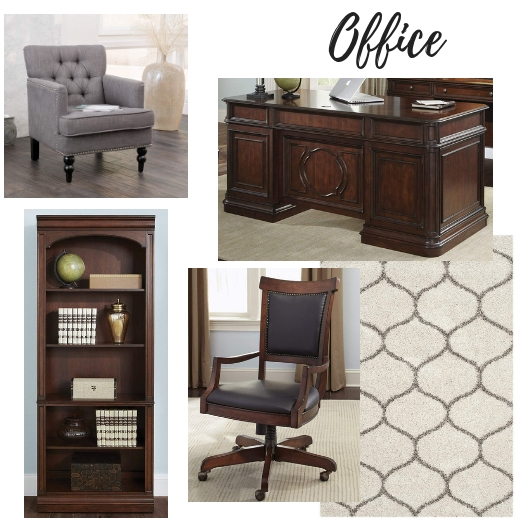 I found this executive desk, matching chair, and two of these bookcases for the room. We also got a shag rug (it's so plush!) and grey arm chair to complete the room. 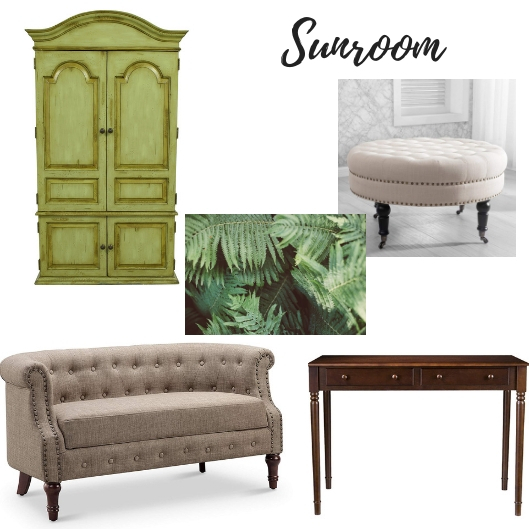 Currently we have a tv armoire, olive green couch, matching chair, leather arm chair, and end tables in the living room. All of our furniture went perfectly! And the people we bought the house from left the pillows they had made to match the valence in the living room. It was like they were made for our things! They were so nice! The sunroom is serving a few different purposes. It is located right off our living room. We have some toys and Aveline's jumper in there. I also have my desk and an armoire I scored for $65 on letgo with all my craft supplies. Eventually we would like to get a settee and tufted ottoman and maybe even a piano for that room. It's a little empty, but that works out when the girls are playing with their toys! There is plenty of room for them and I can still supervise from the living room or kitchen. This might be one of my favorite rooms in the house! Aveline already has a small bookcase, crib, rocking chair, and changing table/dresser. Her room didn't need anything additional. 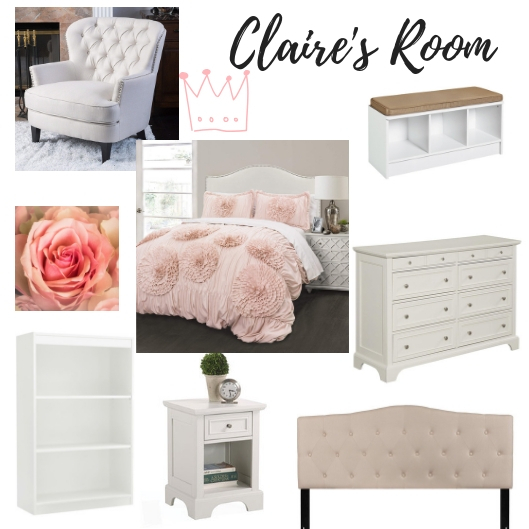 For Claire's room, we ended up purchasing a headboard and bedside table that matched her dresser. She also has a pink ruffled comforter, small arm chair, bookcase, and bench in her room. We have a bedroom set that we purchased about five years ago that we love, but at the time we didn't get the matching nightstands because they wouldn't fit in our small room. Now our room is larger and I was thrilled when I found the matching nightstands to complete our bedroom set! I decided to go with a blue and white theme with lots of porcelain accents. We already have a white tufted duvet cover so I've purchased some blue and white accent pillows. I also got a set of blue glass lamps and a blue and white ceramic lamp. 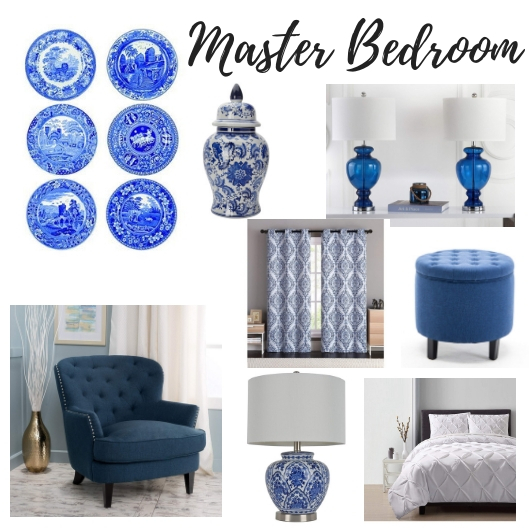 We added a navy blue arm chair and footstool, leaner mirror, blue and white curtains, DIYed floral damask framed pictures, and a set of Spode plates for above the fireplace mantle. I purchased some blue and white porcelain jars and pitchers when Hobby Lobby was having a 50% off sale a few weeks ago for decoration, too. We were able to use our old nightstands as accent tables. One is next to our armchair and the other is in the guest room. I haven't purchased anything for the upstairs landing, but I am thinking about a set of accent chairs and a table to go here soon. I am just looking for the right ones. If any of you have a landing, I'd love to hear how you decorated it, because I am trying to decide if I definitely want chairs or maybe something different. 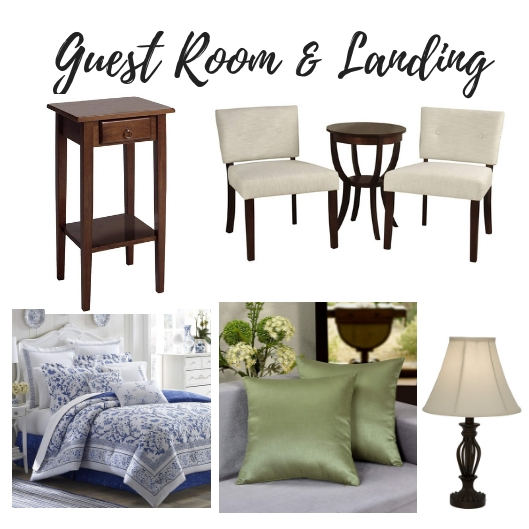 For the guest room, it is mostly furnished with mismatched items. 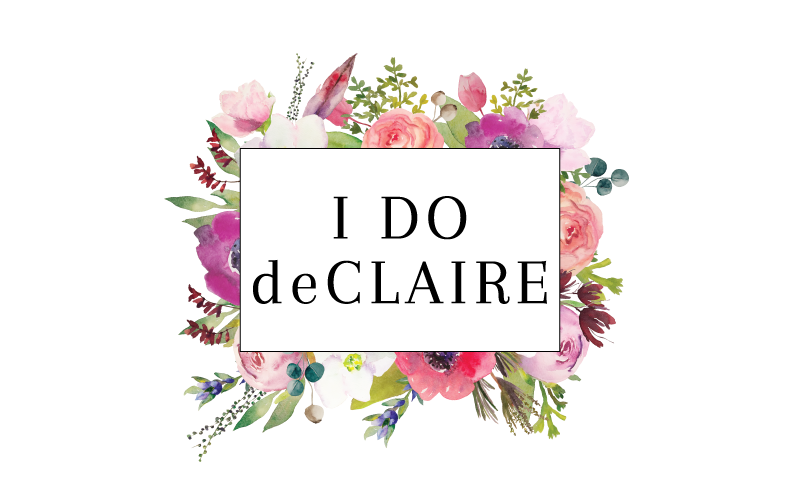 We bought a mattress and bed frame, and comforter set, but Claire's old headboard (which used to be my in-laws) and bedside table are in there now and then our other old bedside table from the master bedroom. Whew! That was a long post to write and put together! I think I have everything included. For the most part our house is done in darker wood with green and blue decor and some burgundy as an accent color. We have lots of sunlight and our trim and doors are white so that keeps everything from looking too dark. Hopefully I can get photos up soon for you all!